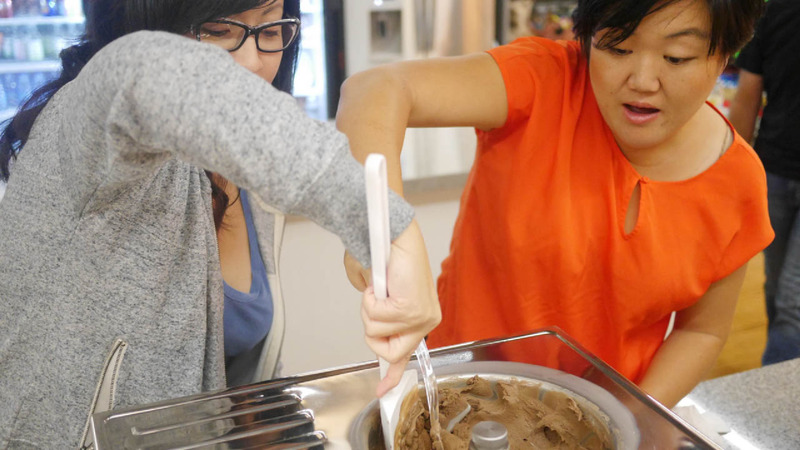 Looking for a fun cooking-themed team offsite for your team? Whether you're looking for a short afternoon activity, or a guided multi-course dinner party--we can make it happen at Tinker Kitchen! 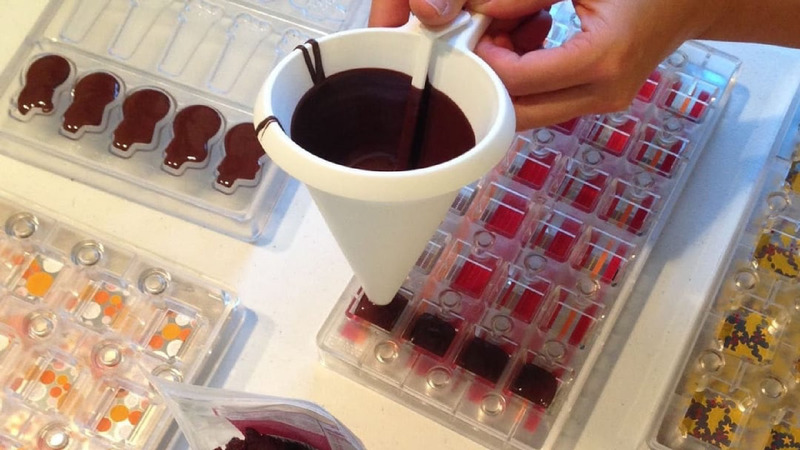 Learn about chocolate and make a variety of shapes of solid bonbons with dark Belgian chocolate. Some will have fancy decorations on the top just like at a chocolatier shop. Decorate boxes and take some home with you to give to a special someone. 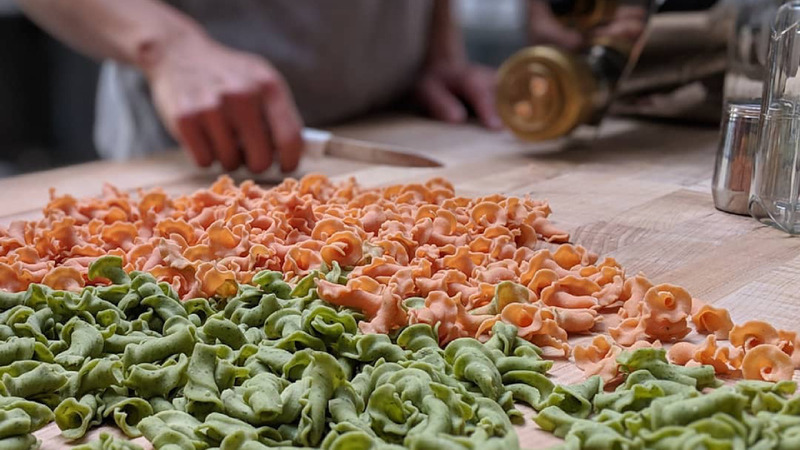 Learn to make pasta from scratch using a commercial extruder! We’ll make different shapes colors, and an oven-roasted tomato sauce to go with it. Learn how to make various flavors of rich custard ice cream using modern techniques: sous vide cooking, batch freezing, and a “paco jet”. Optionally, we can also get liquid nitrogen! Events are usually 3 hours, but we can adapt to your schedule! Let us know and we can customize as needed. Need to include lunch, but you're only interested in a dessert-focused activity? No problem! Just order something in (e.g., pizza) and eat in our dining area. Events larger than 20 people are booked as private events at no extra cost. Smaller events can be made private for an additional buy-out cost. Awesome! Shoot us an email at hello@tinkerkitchen.org so we can schedule. Can't wait to cook with you! 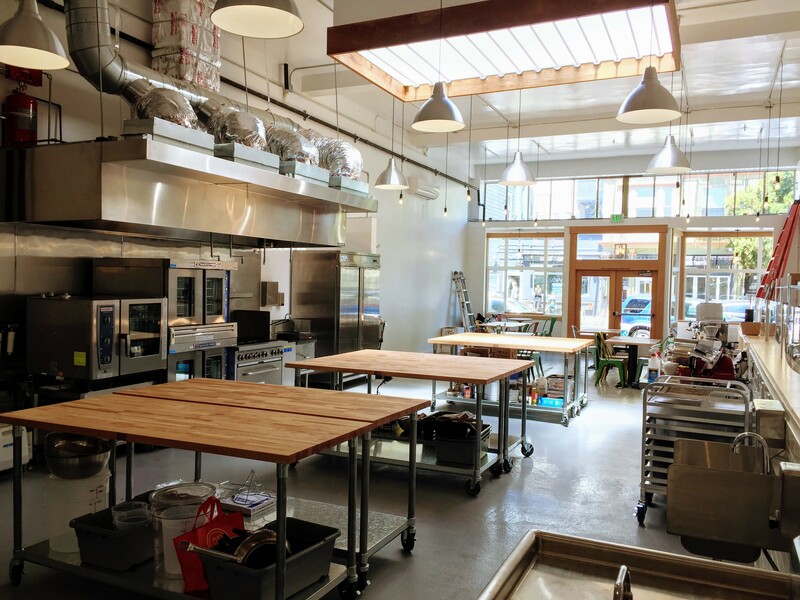 Our space is like a kitchen playground. We have an enormous kitchen in an open-plan space with every piece of equipment you could imagine, plus plenty of space to eat and hang out. You'll have a wide choice of possible activities, with multiple ovens, including a German-made "combi oven" with built-in humidity/steam control, commercial deep-fryer, and even a real wok range. We also have a commercial pasta extruder, ice cream machines (several! ), chocolate-making tools, and even coffee roasters and an espresso machine. Our 1700sqft open-concept space has tall ceilings and lots of natural light, making it very spacious and comfortable. And we've designed it to be easy to re-arrange for different needs—whether you're looking to have a chef come in and do a demonstration, a team cooking competition, a photo shoot, or something completely different. Our space is 1700 sqft in total, and designed to easily adapted to support different uses. Get access to our space for your team-building activity, pop-up demo, class, or other activity / gathering. 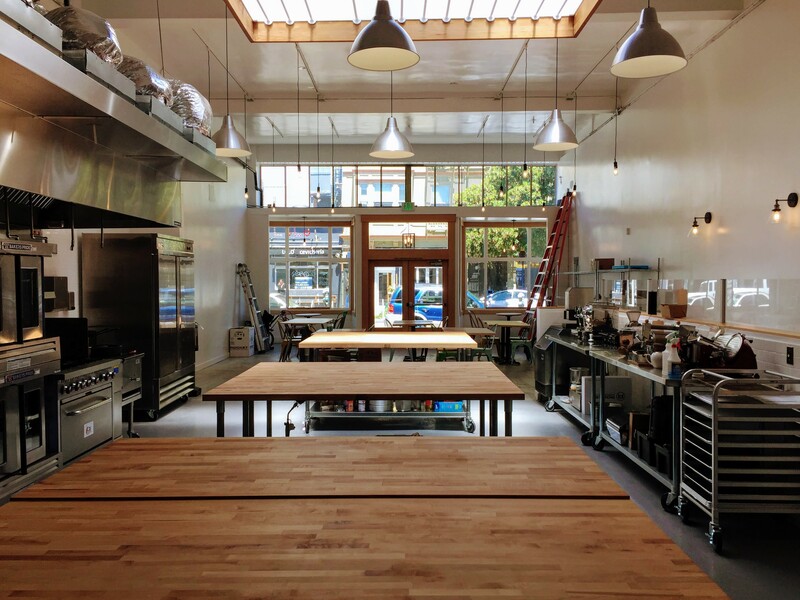 We'll reserve cooking workspaces and seating space as needed, for groups from 10 to 20 people. Exclusive use for your private party, product launch, or other activity/celebration. 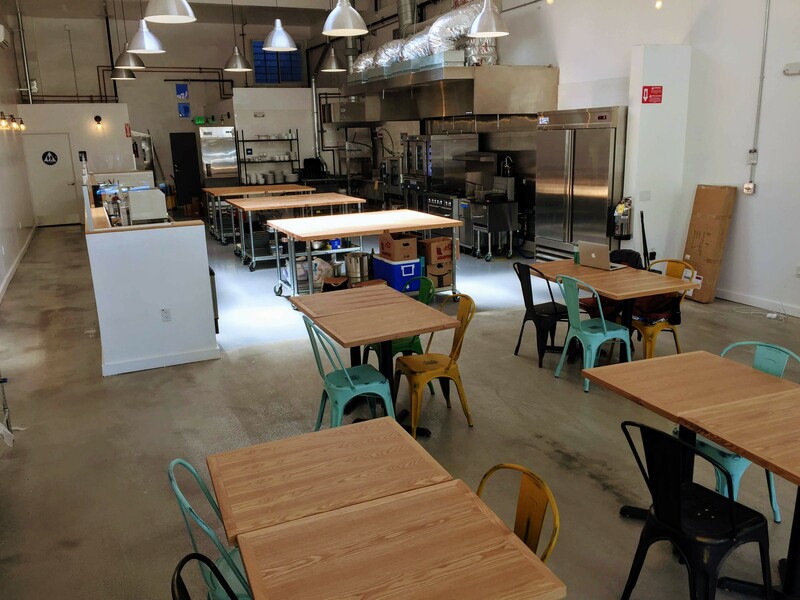 We'll reserve the entire Tinker Kitchen space for you (up to 40 guests), and help you with guidance, logistics, and hiring staff if needed. 2 weeks advance booking required.